the effect of involuntary redundancy on attitudes to work in future jobs. To date, no one has looked into this, and the results could be very far reaching. This isn’t one of them I fear: it’s not that kind of song. If that were so, there’d be no point, in telling this, our saga. Wibbler had a fantastic day with us recently in Boris Johnson’s office. Luckily for him we had secured tickets to the House of Lords Gallery and the House of Commons Gallery so he could get a good idea of the proceedings. would knight Jamie Oliver for his services towards improved nutrition in school food. Had you told me that four shells had landed only 100 metres away, scattering shrapnel, I expect I would have hurled myself to the floor like any other self-respecting MP, a species widely credited with a cockroach-like instinct for survival. Boris forms part of a cross-party delegation of backbench MPs visiting Iraq this week. He will be having meetings in Basrah and Baghdad. 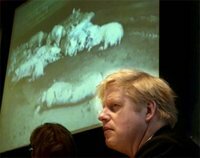 Boris Johnson MP, co-hosting a Country Land and Business Association sponsored video screening and discussion with George Howarth MP, last week denounced the Government’s handling of the 2001 Foot and Mouth crisis and the subsequent ban on swill-feeding. Mr Johnson branded this ban a ‘knee-jerk’ reaction designed to divert and distract attention away from the Government. “The whole of a British industry was destroyed at the stroke of a bureaucrat’s pen. These people had their livelihoods snatched from them by a Government which had, up until a few months before the outbreak, been actively encouraging them to invest in MAFF approved swill processing equipment. “This ban was the result of one farmer’s illegal swill-feeding practices, practices which the Government well knew about. Had the Government acted as it was obliged to under existing legislation, as set out by the Animal By Products Order 1999, then this horrendous episode would never have happened. Instead, our landfill sites pile ever ominously higher, our sewers clog ever thicker and ex swill-feeders such as my constituent Mick Eadle, victimized by a Government desperate to tar anyone and everyone but itself, have lost everything. At the very least I strongly believe the Government has a moral duty to compensate these people”. Ok all you planetbrains out there, help me with this one.